Is your Pattern Failing? Try the SOLIDWORKS Geometry Pattern option! SOLIDWORKS Pattern Failing? Try the Geometry Pattern option! What is this strange SOLIDWORKS Geometry Pattern checkbox? More importantly, why is my pattern failing with no explanation given? These two things might be related. Try changing the state of the checkbox and see what happens! Worst case, the pattern still fails. But sometimes, the pattern succeeds, as if a magic wand had just been waved at it. On tech support we have seen situations where the feature refuses to pattern, but for no apparent reason. And yet, after checking that box, it magically works. We don’t know why; it just does. The checkbox is unchecked by default. When checked, the pattern attempts to blindly copy the geometry of the pattern seed, rather than evaluating start or end conditions in the pattern instances that were in the seed, such as Offset from Surface. As a result, each instance looks exactly the same as the seed, hence the name Geometry Pattern. Another benefit of this option is that it can speed up processing time if there are a large number of instances, such as a panel with thousands of holes. Sometimes, for whatever reason, Geometry Pattern is exactly what is needed to make the difference between a failing feature and a successful one. Home › SOLIDWORKS Tech Tip › SOLIDWORKS Pattern Failing? 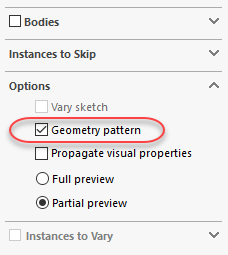 Try the Geometry Pattern option!